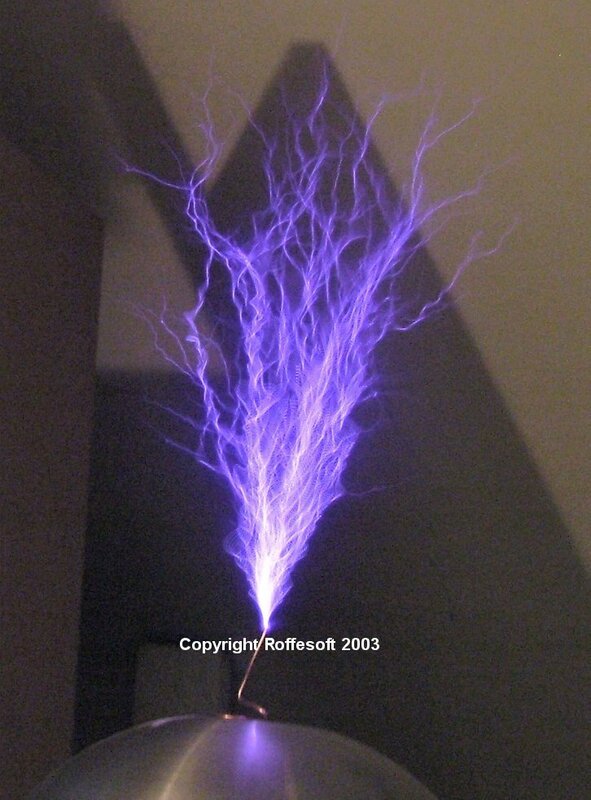 Off line Tesla coil. 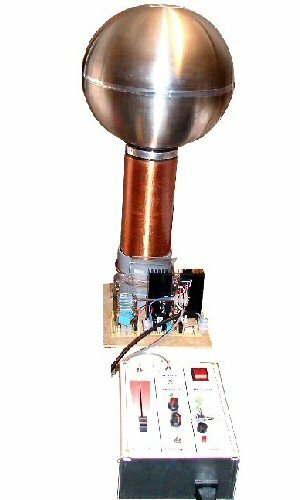 Runs direct from the supply voltage and has no hv step up transformer. 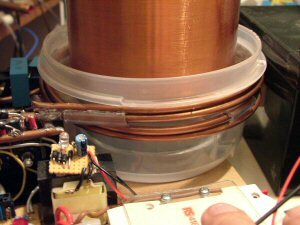 The Primary coil 2 coils of 2 turns of 5mm copper tubeing . 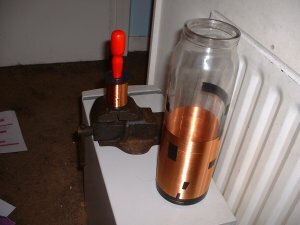 The Secondary 2100 turns 0.125mm enameled copper wire wound on a glass storagejar 4" in diameter. Output 12" Sparks from about 200W in.at 2Khz. The winding was done by hand, It took me about 6 Hours total. It works, It needs some work, but it works. 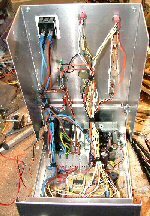 Some more playing, re-built the driver to overdrive the IGBT's as per origonal OLTE spec. Adjusted the height of the secondary to change the coupling. This ment that I could tune the coils more accurately. Much better output 3-4" into air , 6" long sparks to earth. I Then I upped the BPS to around 1Khz, It ran fine for a while, until an arc started between the dequeueing diode and the transorb across the charging inductor. Whatever happened I have an IGBT , transorb and a diode to replace, so time for a minor rebuild and the addition of a small fuse in the charging circuit after the capacitor to prevent it from happening again. The Failure was caused by a trapped wire in my control box adding 50hz to the gate drive for the IGBT's, Hopefully this won't happen again. After Various component replacing & problems I got it running again.Two things became obvious, The turn off of the igbt's must happen accurately at zero voltage otherwise the losses are large and the coupling from primary to secondary is very important. To adjust the coupling I added various sized "chocks" under the secondary until I got maximum output, The "on time" of the igbt's also needed adjustment as the coupling changed. I changed the variable for the "on time" adjustment to a 10 turn pot, this allowed for much more accurate setting. 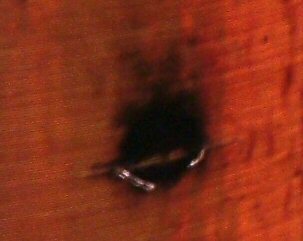 After reaching about 6" sparks (with running sparks down the coil) I decided that I still hadn't got the tuning right. By adding another topload I proved that the primary cap (1.88uf made from 4 x 0.47uf's) was too large, so I removed a 0.47uf and replaced this with 4 x 0.1uf's, (better) and then 3 x 0.1uf's even better. 2 x 0.1uf's did not improve the output so I stuck at 3 giving me a primary cap of 1.71uf. For the technical, two traces. 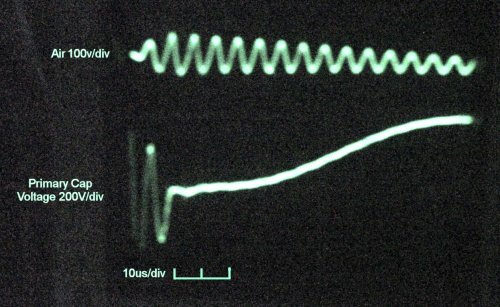 Top trace is from a scope probe about 1M away from the coil. Not actually connected, just the probe. Click picture for a movie of My OLTC "testing" a computer mother board. 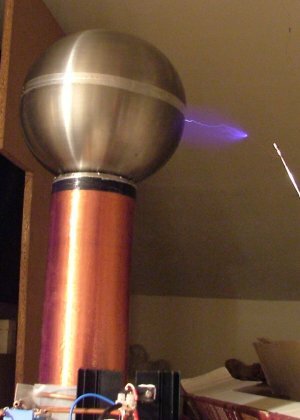 Alternate Drive - Off line Tesla coil. An upgrade to MY OLTC too double the power. 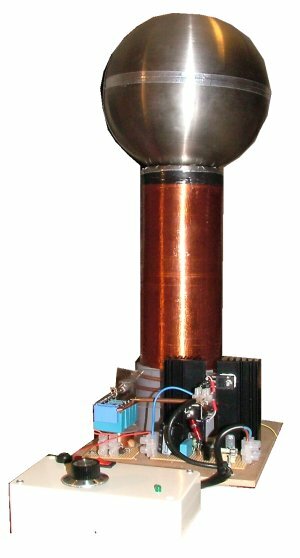 The Secondary 2100 turns 0.125mm enameled copper wire wound on a glass storagejar 4" in diameter, 11" tall..
Drive 4 x IGBT's, fired Alternately in pairs. The New controller , To allow for driving the IGBT's alternately, I had to construct a new driver. As I was making a new driver I thought I may as well include all the features I may need in the future. 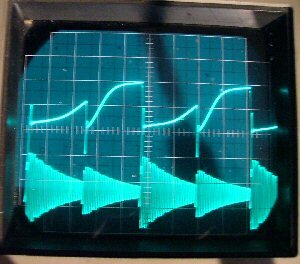 E.g 0-10Khz BPS settings, Interruption with variable mark space and TT mode (more later). Quenching is now set with a 5 turn pot on the front panel. 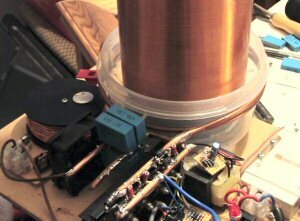 Close up of the primary coil wiring and IGBT's all "wired" with 5mm copper break pipe. 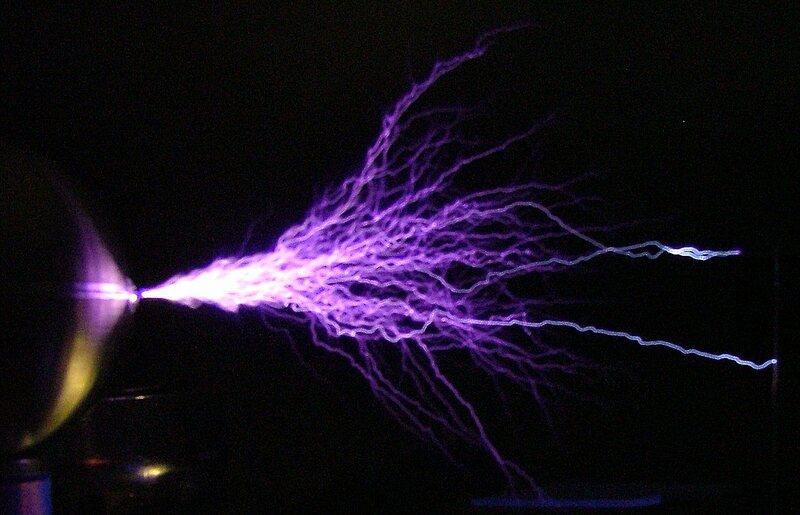 bottom Trace is the secondary voltage, pickup from an unearthed scope probe. 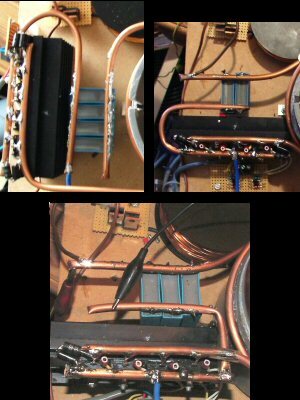 The Top Picture is the coil running at low frequency around 200Hz. 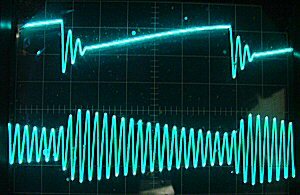 The bottom picture is the coil running at 4Khz showing some strange charging problems, and the bangs happening before the coil has stopped resonating. These two observations are probably connected. As the effect changes at different high BPS as if the oscillation on the secondary is becoming out of phase with the next bang on the primary. The bottom trace also shows that the charging inductor needs to be of a smaller inductance, to charge the capacitor up faster. 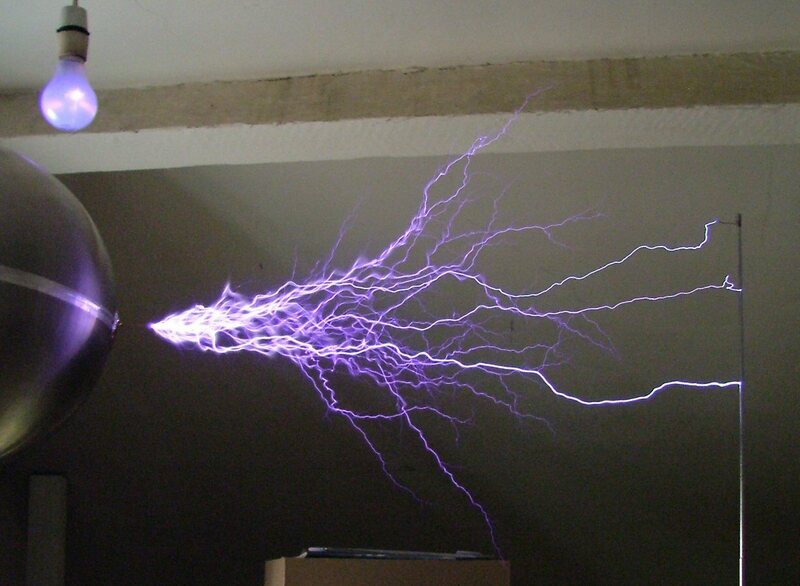 This may also increase the charging voltage by flyback effect. A new topload from Ikea, now 10" in diameter (was 8") means that I can now use a 2.45uF primary cap. 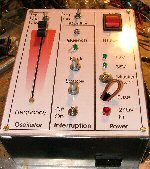 The primary is only roughly tuned as yet and as I haven't changed the charging choke (yet), I can't run at full power, but with an interrupted (10hz 1:10 mark/space) drive of around 5Khz (had to change charging fuse to 5A one) , I'm now getting 17"+ strikes to earth easily and still some power / frequency to go yet. 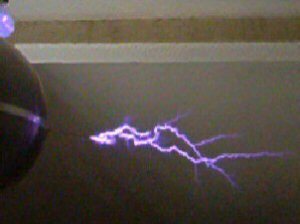 (pretty good with an 11" secondary 🙂 ) The IGBT's were cold after about a 30 Sec run and the sparks were still growing at the 5Khz mark. The new top load is scary, the field it creates is much larger than the 8" one, standing 1M+ away from the coil I get 1/4 sparks from me to the earthed case of the controller.. I've added a new Charging choke, to give me a quicker charge, and a little more voltage on the primary caps. It also is giving me much longer sparks at lower BPS's. The new choke is 2.5mH, made from a whole real of 1.25mm enammeled wire. I had to wind it to fit the space available 1" x 3". 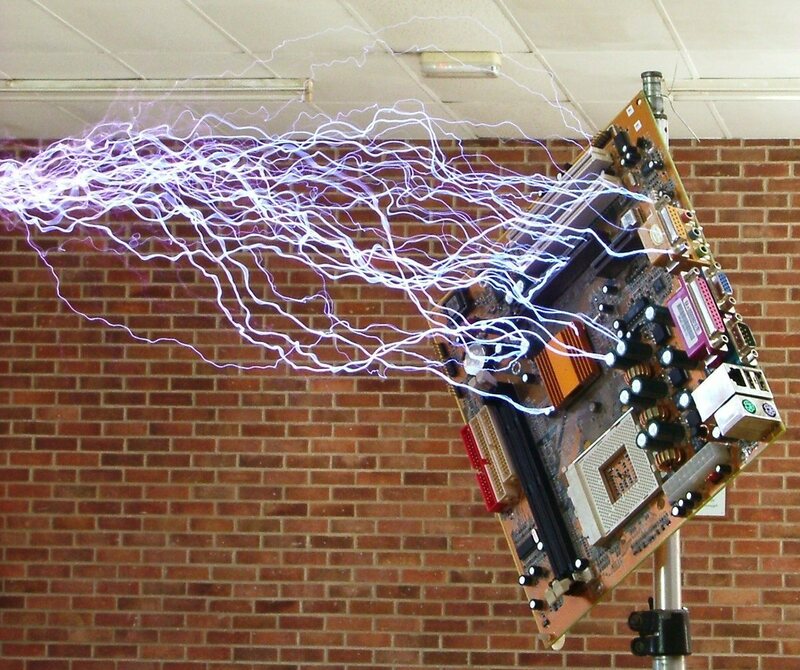 I think the older choke (RHS of picture) was saturating and net being as high impedance to hf as it sould have been. 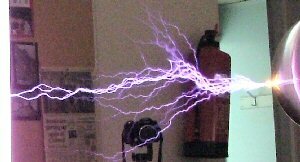 This photo was taken at around 5Khz with the interrupter set at around 50%, after a 20 sec run the IGBT's were warm to the touch. 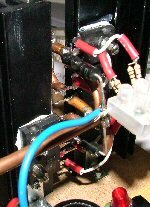 Click for a Video of the coil running. TT mode Running, At the Derby Teslathon. TT mode allows the OLTC to Play Twinkle Twinkle little star whilst running. Running at the Derby Teslathon I had loads of problems with strikes to the mosfets and strike rail resulting in the damage to the secondary. 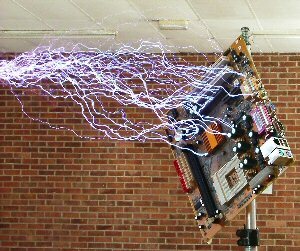 This is only of the problems in putting more and more power through a coil, eventually it self destructs. So after blowing up the AD-OLTC I though it was a good time, not just to repair it, but rebuild the HV side. So.. 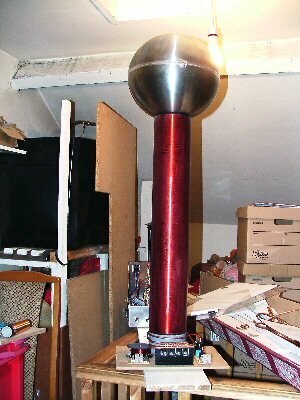 The size of the old coil was 11" and I was getting 21" sparks.. And them I'm supprised when it arced over ? 😉 ..
Time for a bigger coil.. 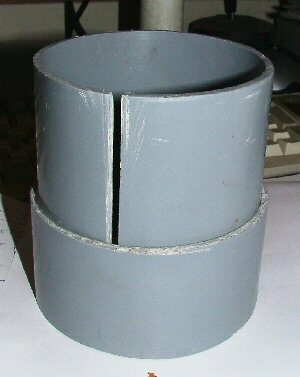 Here is the coil 3/4 wound, I would it by hand, the tape is to prevent the coils from loosening if I let go.. To keep things simple I decided to wind the coil on 4.25" PVC waste pipe. I would need to change the coupling of the coil to obtain maximum spark length, So this is the base of the coil, the fatter peice will hold the primary coil and the top peice will hold the secondary, The slit is to alow the earth from the bottom turn of the secondary to the earth post in the centre of the coil. The primary is held high so that all of the other components can be underneath it. This allows for a strike rail, and an insulated disk around the base of the coil. Im going to try a single primary, as this simplyfies the wiring, and I beleive that the current sharing in the IGBT's will be OK for one of them not to take all of the load. This also gives me the option of firing them all in parallel if required.. 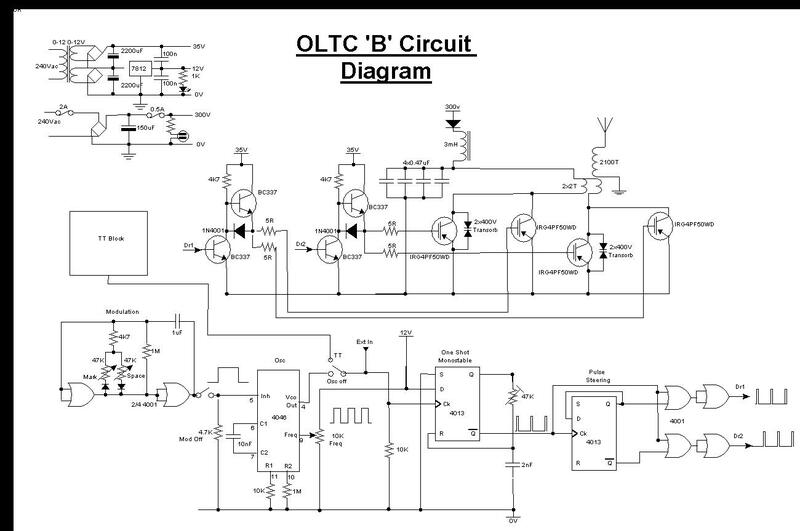 The IGBT's are wired in a much simplified way. This allow for easier changing of dead ones. 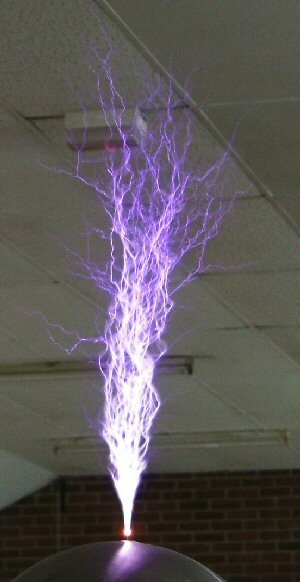 The connections are deliberately "Z " wired, to reduce inductance, and to ensure that there is the same current flowing in each IGBT. Ouch!!. It used to be a desktop coil. The scary thing about this is that there is almost nothing at the base of the coil, I may have to add outriggers.. 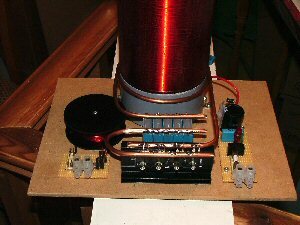 The finished Secondary coil has 1970 turns, and I have applied 5 coats of varnish. In this picture I had just rubbed down the coil between coats, hence the appearance. I've repaired the damage to the controller, another 4046 and a 4011 to add to the silicon cemetry. Also the main power slider had developed a strange fault where by it read about 25K (it was a 10K slider) and at its lowest point it would only read 10K to 0v, this ment that the scale started at 1/2 power. It does make me wonder if this was the cause of the inital primary arcs is the power suddenly jumped up due to the faulty slider? When I took it apart it looked like there had been some power flowing through it. The only wat this could have happened is if it had touched the earthed case. 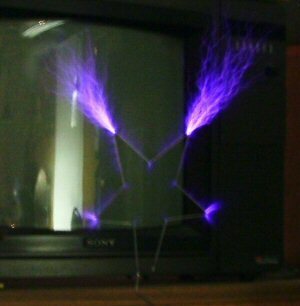 (The electronics are referenced to bridge rectified mains 0V not earth). So I need to check the insulation from the slider to the case.. 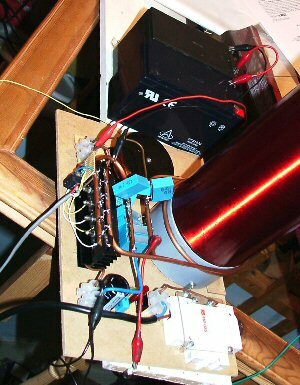 I'm in the process now of tuning the coil using a 24v DC supply. The method I use is to set the quench time as long as possible and to move the coil up, to give me as low a coupling as possible. Using the larger caps (0.47uF) ,keep adding them untill the output starts to get smaller. Then by placing my hand near the topload (increasing its capacitance) I can judge if the primary is in tune. If (when I place my hand next to the toroid) the output increases, then the primary caps need to be smaller. If (when I place my hand next to the toroid) the output decreases, then the primary caps need to be bigger. Continue this process untill you have the biggest output possible.. Which is much smaller than it was before I changed my secondary coil. Infact Exactly Half.. I need to look further into this.. Couls be from having only one primary coil, or It could be that the secondary being double the length has less inductance.. 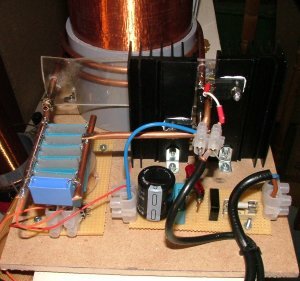 I started with the set of capacitances I had with the old OLTC around 2.5uF, As I tuned It was obvious that the capacitance would need to be smaller to bring the coil into resonance. I ended up with 1.5uF a whole 1uF lost. After asking around various suggestions were put forward as to why, stray inductance in the primary was the one I thought was the issue, So I re designed the primary layout a few times to reduce the stray inductances. 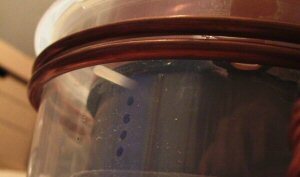 But it did reduce the losses in the primary, so now the coil will ring for longer, so not too bad an excercise after all. I beleive that the problems I am having is due to some mistakes in some figures I put into Win Tesla to calculate the inductance of the secondary. I have now measured the secondary at 51mH, where Win Tesla makes it 69mH, I think that this could be the cause of the lower primary capacitance. I'm going to have to run with it for now, and get a bigger topload to bring down the Frez at a later date.. I can almost get cw operation. 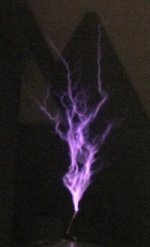 So Amberley Teslathon happened. The OLTC ran quite well, untill I had another problems with the controiller taking out the 4046 again. I beleive this is caused by a spark jumping from the operator to the slider of the power control. This is connected directly to the input of the 4046 so blows the chip. Im going to try two diodes to the supply rails to hopefully shunt this away to somewhere safe. The IGBT's are still running hot and im not getting the spark length I should be. I need to increase the coupling, probably by allowing the secondary to drop down into the centre of the primary. I've found a circular sandwich box, that has a diameter of 140mm for an external primary to give me enough room to sink the secondary below the primary. 140mm is a slightly larger primary that I would have liked , but it was the best I could find, So I have wound the primary around it to try. To allow the coupling to be changed, I have drilled a series of holes in the inner former this will allow me to put in a set of screws to change the height of the secondary and give me different coupling arrangements. I've tuned up to the new primary dimensions and roughly set the coupling. Unfortunatly the primary being a larger diameter then before has increased inductance and has dropped my primary cap size to 1.3uF 🙁 . Increasing the coupling worked, I can get ring up in 2.5 cycles which means that I can run at the higher BPS's without excessive heating again. Increasing the BPS is strange. 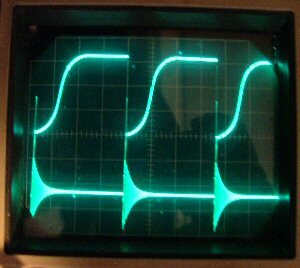 I get a linear response (spark length to BPS) up to around 5Khz. At this point I'm starting to get the next bang during the ringdown of the secondary from the previous one. From this point on I get alternate points of better / worse spark length as the position of the next bang is either in or out of phase with the secondary, but the peaks are BIG!! . I'm back up to a similar performance as I was before (around 20"), even with a smaller Primary Cap. I do have to run with my interrupter to keep the input current draw down as 7K BPS gives me 2KW average and I don't think the IGBT's would stand that sort of abuse. The streamers from the coil are "curly" and sword like at high BPS, not the sort of streamers you would expect from a disruptive coil at all. The coil also "found" some neon tube I had stored along the roof beams, as I wound up the power the whole place went RED. I thought some thing had blown up, but I'd managed to light up all three 3' neon tubes to almost full brightness. The Blue globe in the background to this picture is a normal light bulb about 70cm away. (turned off) giving a pretty display all of its own. The electronic one failed, I'm not too sure why 🙂 . 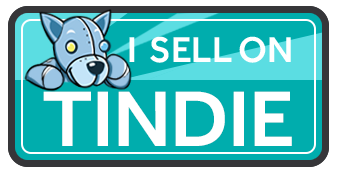 Click the picture for a movie of the AD-OLTC running at high BPS. I was playing with my OLTC calc and I found something very obvious. 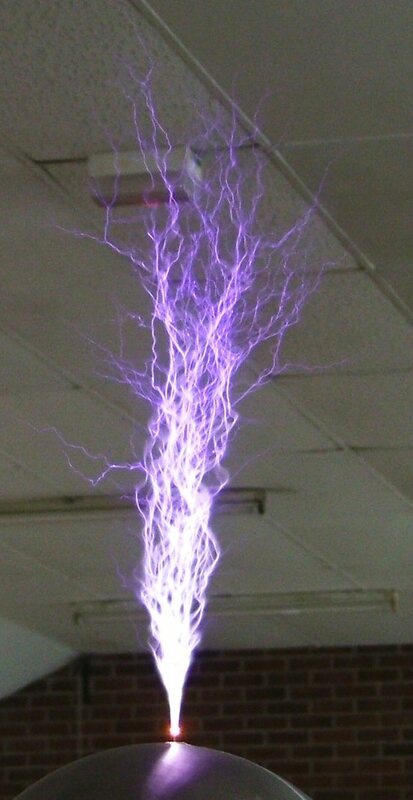 If you have thicker wire the inductance decreases. 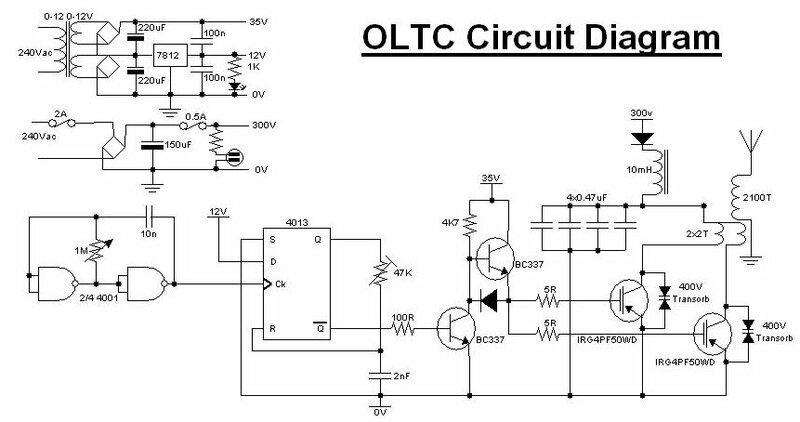 The first OLTC I built, following Steve Connors circuit, had a double wound primary to share the current between the two IGBT's, but it also had a lower inductance. When I started the upgrade I went to a single coil as I knew (now) that current sharing in IGBT's was not an issue. I noticed instantly that the inductance had increased, but as two coils in parallel have the same inductance as a single coil, I dismissed the fact that the conductor was twice the size. So I remade the Primary (AGAIN) with a double winding of break pipe (I must get shares). It has reduced my primary inductance by 0.43uH and increased my Primary Cap to 1.71uF still not up to 2.4uF but better.. but this is now limited by the larger diameter of the primary. 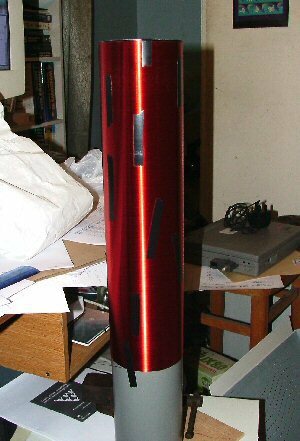 The successive mods to the primary have done it :-D , I'm back to where I was before the Secondary blew.. 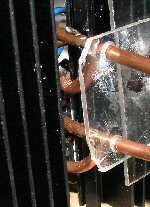 This picture is of arcs to a grounded ariel 19" away from the topload breakout. (click for a better image). 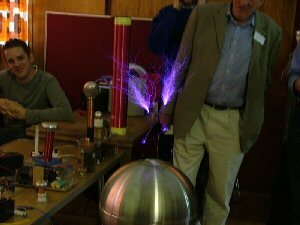 I took my AD-OLTC to the Gaussfest (a teslathon). The coil worked like a dream, I could run it at full power (7K BPS) without any interruption. and I got a confirmed strike of 23" Not bad for a small non brick OLTC. The AD-OLTC running at 7KBPS (flat out) this is at a power of 2.7KW , the intense yellow light on the RHS was a drawing pin I used as a breakout.